A Concept Map is used to display relationships that occur in a concept and how logically connected its components Concept mapping involves different elements that can be managed using ConceptDraw DIAGRAM. The ability to create concept diagrams contains in the Concept Maps solution. Using the export capabilities of ConceptDraw DIAGRAM you can export your ConceptDraw documents (CDDZ) to MS Visio 2013 format (VSDX). That allows you to share your business graphics with MS Visio users. Open a concept map diagram, created with ConceptDraw DIAGRAM. Select Microsoft Visio 2013 (VSDX). From the Open window, select the desired file to be exported. Click “Ok”. 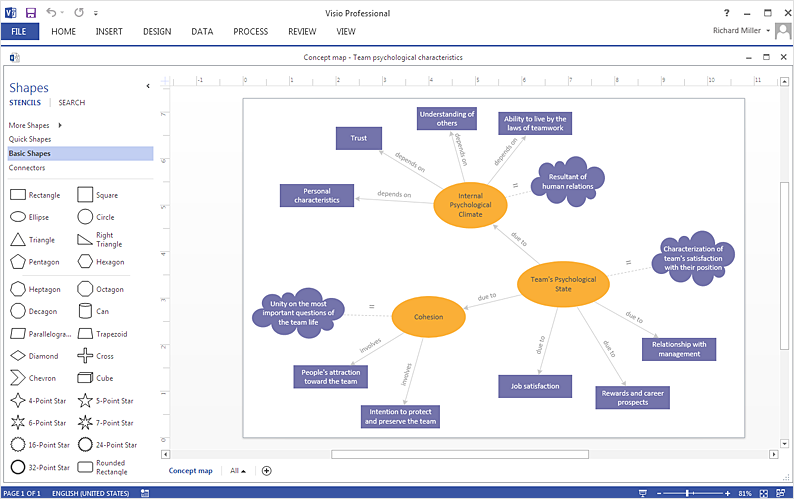 Result: You can easily design a business documentation pack including concept maps and easily share it with MS Visio users.